You are often in need of a quick fix when it comes to things around your home or any of your belongings, really. This can either be a leak in your bathroom or a crack in your wall. Other times, you may be looking to fix a broken flower pot. What is Flex Seal Liquid ? First things first, what exactly is this product? Flex Seal Liquid is contained in a can. Here, it remains in a type of viscous, liquid formation. It is only once the liquid is exposed to air that it begins to ‘cure’. When this happens, the liquid begins to slowly toughen. This is what allows it to act as a sealant. However, instead of hardening, it becomes a consistency much like rubber. Therefore, there is some flexibility to the Flex Seal once it is dried. The reason behind this flex is that it prevents the sealant from cracking. This means that the seal will last for a longer period of time and is less likely to be affected by various elements. Also, the liquid can expand, contract, and even stretch to a certain extent. Flex Seal Liquid is available in four colors. You can get in either a clear coat, black, gray, or white. It can also be purchased in different sizes. The large contains 16 ounces and is capable of covering up to 20 square feet. The Jumbo Size is thirty two ounces and can be used on an area of 40 square feet. The One Gallon option can cover around 150 square feet. The Flex Seal Liquid has a shelf life of about two years, as long as it is stored appropriately. To prevent a skin from forming a layer over the product, you should close the lid immediately after using it. This will help to prolong the life of the Flex Seal Liquid. 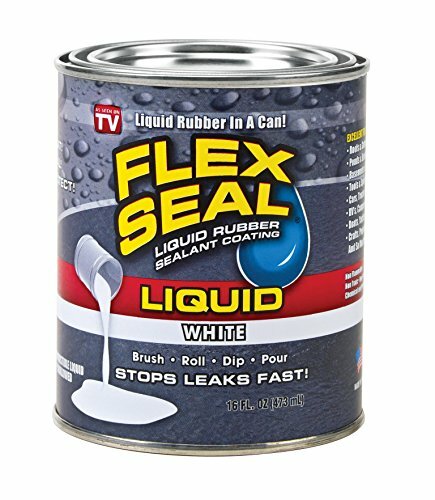 What can Flex Seal Liquid be used for? What Flex Seal Liquid can be used for is only limited by your imagination. Whether you need to use it in the form of a sealant or an adhesive, you still get excellent results. As such, you can use this product for a variety of fixes and functions around the house. 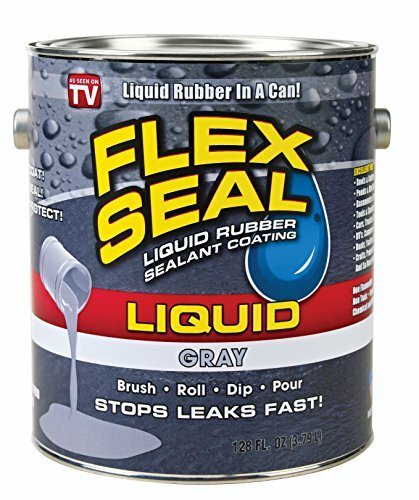 Flex Seal Liquid can be applied on a number of surfaces. The list includes glass, concrete, wood, tile, plastic, metal, fiberglass, vinyl, foam, and even fabric. The only requirement is that the surface is dry, smooth, and clean. This will allow the substance to adhere to it much better and allow the sealant to be more effective. Flex Seal Liquid is particularly good at making sure that water does not leak through. This means that it can be used on basement walls to keep the area dry. You can also use it on certain cracks in piping to ensure that the water will not come through. The final product is both waterproof as well as weatherproof. You can use it both indoors as well as outdoors. In certain instances, this liquid sealant can also be used on vehicles as well. As long as you are not using it to patch up a tire or fix the gasoline tank, the product will hold most things on your vehicle together. You will just need to avoid parts that are either incredibly compromised or are structurally important. It can even be used on small patches of a small vessel such as a boat! There are four different ways that you can use Flex Seal Liquid. One of your options is to either use a brush or a roller to spread the liquid. This method can be employed if you want to deal with thinner cracks or smaller holes. If you want to coat a particular object with the liquid, it is simply a matter of dipping it into the can. Once the surface has been completely coated, you can let the excess drip away. Last but not least, you can just pour the liquid into any holes or cracks that may be larger in size. The amount of Flex Seal Liquid that you used as well as the temperature will affect just how quickly the product sets in. On average, it can take between 24 hours to 48 hours for the liquid to be completely set. It is only then that it will be fully resistant to climate, temperature, weather, and other factors. Typically, the liquid will cure much faster during the hotter or drier months. While it is still effective in lower temperatures, it may take a little longer. You will need to make sure that the areas to which you have applied the sealant remains dry at least for twenty four hours. You can paint over the Flex Seal Liquid, if you choose. Nonetheless, the manufacturing company does not recommend that you do that. The consistency of the dried paint impacts the manner in which the cured sealant behaves. Why should you use Flex Seal Liquid? It is clear that Flex Seal Liquid can be used for a variety of purposes. Apart from that, however, why would want to use this product in and around your home? Well, first off, this is an incredibly resilient and durable sealant. As mentioned, it is waterproof which is why it is such an excellent sealant. It is also weatherproof which makes it resistant to UV degradation, extreme temperatures, wind, and even snow. You can be reassured that this sealant is going to be just as effective, all year round. That’s not all that this product can ward off, however. It is even great at keeping various strains of mildew at bay. Even if the sealant continues to get wet, you can be quite certain that you don’t have to worry about it getting moldy. This is why it can even be used in areas that are constantly submerged under water. Then there is the fact that the sealant can withstand a lot of chemicals as well. This greatly reduces the likelihood of the sealant deteriorating or wearing away despite being exposed to other substances. All of this means that the Flex Seal Liquid is also quite safe. As you don’t have to worry about it slowly sloughing off, there is no problem in using it around plants or even animals. This sealant is easy to use – you don’t need to mix it with anything else, dilute it, or conduct any other prep work. It is simply a matter of using it right out of the can. In addition, you can use it any way that you choose. It can be spread with brushes or just poured wherever you need it. There are a variety of colors to choose from. This means that you can ensure that your handiwork is virtually unnoticeable. You can use a shade that corresponds to the surface that you are working on. If you can find the right color, simply use the clear coat – you will barely be able to see it. You can decide between several sizes, depending on the magnitude of your project. If you want, you can always buy a larger amount and store it under the right conditions. 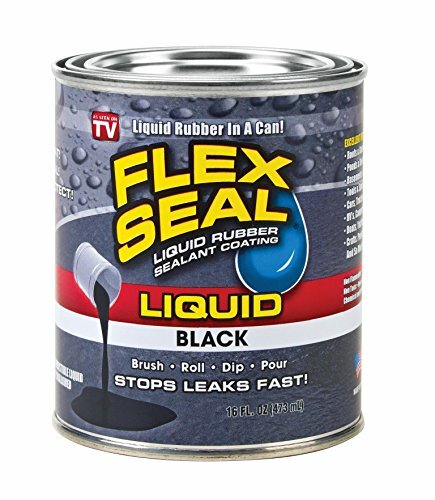 Since a can of Flex Seal Liquid can last about twenty-four months, you will be able to easily use it during this period. It is also quite difficult to make a mess with this sealant. It comes in a can with a wide mouth, making it easy to pour or dip. Even if you do happen to spill some on the floor or other surfaces, you can clean it up quite easily. All you need is a cloth and some mineral spirits. While this sealant is quite effective, there are some areas in which it does not perform quite as well. The main area of concern is pressure, in particular, water pressure. While the sealant can be used to stop water from leaking and can even be used in immersed areas, this is dependent on the pressure. It cannot be used as well in places that are prone to extremely high pressures. The sealant may peel off as a result. Just how much pressure it can deal with will be determined by the conditions under which it is applied. For best results, you should make sure that the weather is warm but not overly humid. The ideal temperatures for this sealant is between 32° and 120°. You will also need to ensure that the surface that you are applying the sealant to should be dry and not be covered in any grease or other substance. The Flex Seal Liquid was manufactured with very little margin for cons but c’mon, this is a review and what good have we done if we can’t prove that efficiency is never a hundred percent (100%)? Is Flex Seal Liquid right for you? This is the most important question that needs to be answered – is it worth it for you to purchase this product? The answer is a resounding yes for many reasons. The first, of course, is the versatility of the sealant. You can pretty much use it anywhere, for any fix, and not have to be concerned with how well it holds up. Whether you are trying to fix a leak or just put two pieces back together, this sealant can handle it all. It is unlikely that you can say the same thing about any of your other tools or sealants. For this reason alone, it will be one of the most useful items in your household. Then there is the fact that it is incredibly durable. Not only can it withstand water, it won’t disintegrate under continuous exposure to UV lights. This means you will not have to contend with the typical cracking or peeling as with other products that are left out too long in the sun. Even if the sealant remains in stagnant water, it is unlikely to grow mildew or other types of growth. Just imagine being able to use it at the bottom of a fishing pond, for instance! Even if you are not particularly skilled in the art of home improvement or DIY projects, it doesn’t matter. This is because it is a fuss-free product that can easily be used by all. You also get to decide which way you would like to use it. You can paint the sealant on with a brush or you can pour it over a hole or a crack, it is up to you. 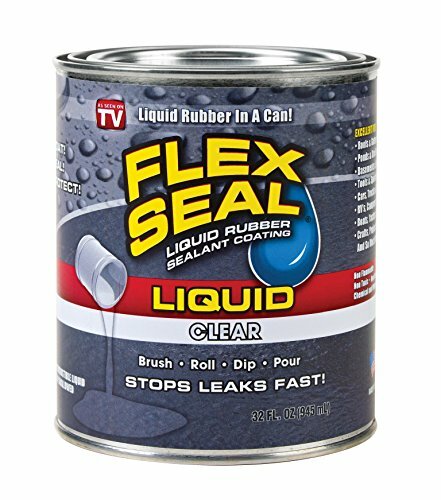 It is quite unlikely that you will come across a product quite like Flex Seal Liquid. When you purchase this sealant, you are guaranteed excellent quality and a product that you really can believe in. Once you see what the Flex Seal Liquid can do for yourself, you will be unlikely to want to use any other sealant or adhesive again.